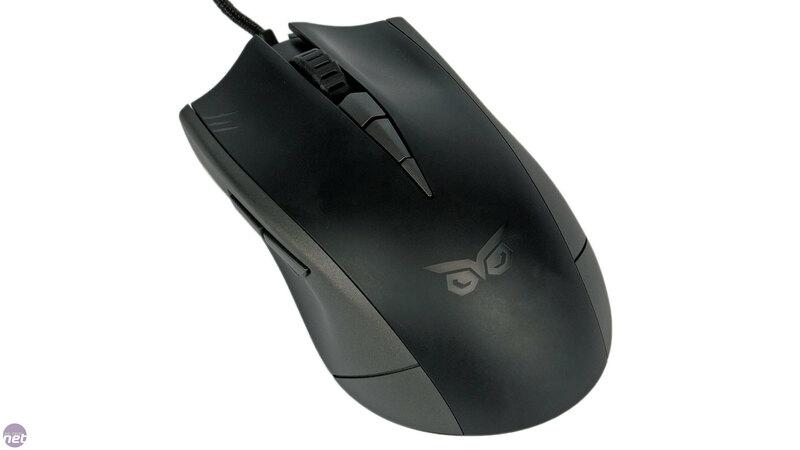 Like the ROG Gladius, the Strix Claw is a right-handed mouse aimed predominantly at FPS players. It actually has two extra buttons than the Gladius (eight total), despite costing around £20 less, but it lacks extras like the replacement switches, detachable cables and ROG branding, and its optical sensor caps out at “only” 5,000 DPI compared to 6,400 DPI. The Claw has a plastic construction but is very solid. Both the black and grey parts of its surface have a smooth, matt finish – there's no textured or high-grip side sections. 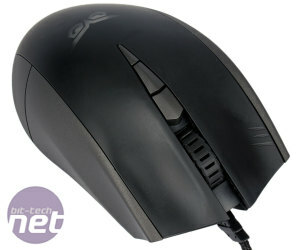 The underside sports three Teflon feet for smooth gliding and the 2m braided USB cable emerges from the centre of the mouse and is angled upwards, successfully avoiding drag and snags. The shape of the Claw makes it very pleasing to hold in a palm grip, as the hump is nicely placed and well-shaped, while your fingers fall naturally into the main buttons, which are quite heavily contoured to stop them sliding around. 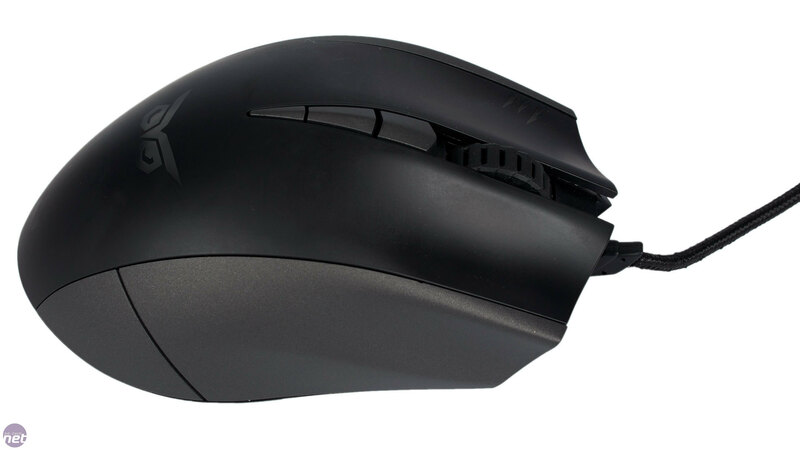 We also love the slight grooves on the right, which provide resting spots for your ring finger and pinky without making the mouse as wide or as hand-filling as the Mionix Naos 8200, for example. 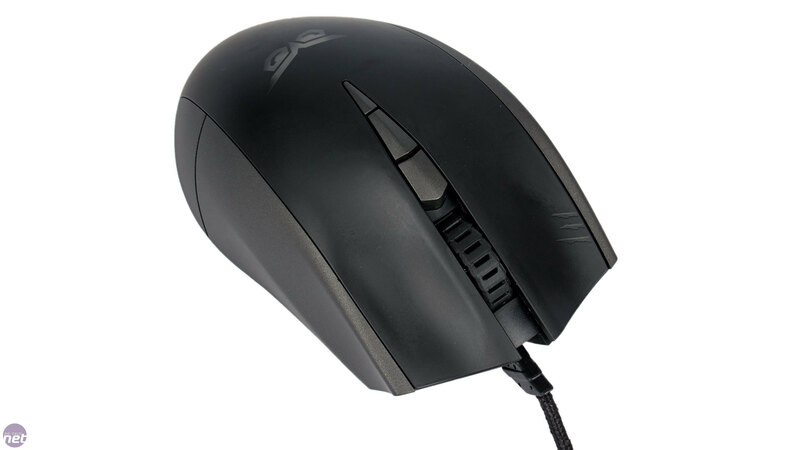 Unsurprisingly given the name, a claw grip also works well, but with a finger-style grip we found the mouse to be too back-heavy. Nevertheless, with a shape that's comfortable for both palm and claw grippers, an overall size that's neither tiny nor massive and a mid-scale weight of 110g (non-adjustable), the Claw should prove easy to adjust to for all but the fussiest of players (and left-handed ones). 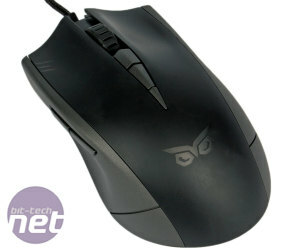 Japanese made Omron D2F-01F switches give the main buttons a lovely, finely-balanced action – Omron switches are fast becoming the norm for mid-range and high-end mice, and we have no issue with that. The scroll wheel is secure and has a pleasant rubber coating; it also feels lightweight when scrolling but the well-defined steps mean it's a satisfying action nonetheless. Behind it lie two DPI adjustment buttons. As is often the case with such designs, the furthest forward one is easy to reach, but the one behind requires quite a bit of finger scrunching to get to. Then again, they don't use high resistance switches, so you wouldn't want them too far forward in case of accidental actuation when scrolling, for example. The three remaining buttons are controlled with your thumb – the standard forward and back buttons and a DPI clutch, which lowers the DPI whilst it's held down. This is great to see, as it can be a real aid when trying to pull off accurate long distance shots, for example, and it's something that many competitors leave out too. All three buttons are placed within easy reach of your thumb, with the oversized DPI clutch in particular being very easy to trigger with minimal movement at a moment's notice. Aims at the gamer on a budget.